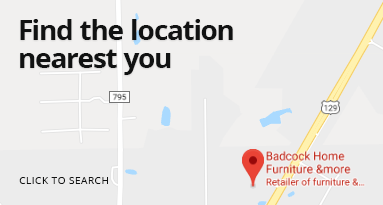 At Badcock Home Furniture &more in Shelby, North Carolina, our friendly staff is ready to help you find quality furniture and appliances that fit your style and budget. Stop by our store at 1404 North Lafayette Street Shelby, North Carolina 28150, just minutes off Highway 74. We are open Monday through Friday 9:00 a.m.-6:00 p.m. and Saturday 9:00 a.m.-5:00 p.m. You can reach us during any of those hours by calling (704) 484-0486. We hope to see you soon! Over one hundred years ago, Badcock Home Furniture &more was founded by Henry Stanhope Badcock in Mulberry, Florida, where our headquarters is located today. During the Great Depression in the 1920s, Henry's son, Wogan, saw that many families were struggling financially and were unable to afford the furniture they needed. Seeing an opportunity to help, he decided to sell furniture to clients on credit and allow them to pay it off in installments. This allowed many people to provide their family with the comfort that a home should have at prices and payments that worked for them. Today, we still value Wogan's notion that everyone has a right to a home they feel confident about. At Badcock Home Furniture &more, we make it easy to have the furniture and appliances that you want at prices you can afford.